Serves 8 or serves 4 with leftovers. Steps 1 to 7 take about 1 hour and can be performed a day in advance and refrigerated overnight. 1. Prepare a bouquet garni, by wrapping the bay leaves, thyme sprigs, shallot & garlic in a piece of cheese cloth and tying it off. 2. Separate the drumsticks from the thighs and cut each breast in half leaving the wings attached to the upper half of the breast. You will end up with 16 pieces of chicken. Liberally salt and pepper each piece. 3. Place the chicken pieces and the bouquet garni in a large non-reactive bowl and cover with the contents of 1 bottle of the wine. Cover the bowl and refrigerate, marinating the chicken for 6 to 8 hours or overnight. 4. Bring a small pot of water to boil, add the pearl onions and blanch for 1 minute. Remove the onions and when cooled, remove and discard their skins. 5. Re-boil the water; add the bacon slices and par-boil for about 3 minutes to remove some of the saltiness. Drain and pat the bacon dry. Heat a non-stick sauté pan on medium and fry the bacon until cooked but still soft about 3 or 4 minutes. Remove the bacon, slice into ½ inch wide pieces and set aside. 6. Remove most of the bacon fat from the sauté pan leaving about two tablespoons. Add 2 tbsps. of butter and then the skinned onions, brown on high heat for about 3 minutes, remove and set aside. 7. Repeat step 6 with the cremini mushrooms, adding 2 tbsps. of butter and browning the mushrooms for about 5 minutes. 8. When the chicken pieces are finished marinating, drain and pat them dry; reserve the marinade and the bouquet garni. 9. Dredge the chicken pieces in flour. Melt 4 tbsps. of butter in a stainless steel sauté pan on medium heat and brown the chicken pieces well, for about 10 minutes turning them several times. You will probably have to do this in two batches. 10. Remove the chicken to a large casserole, or Dutch Oven. 11. Add the cognac to the sauté pan; bring to a boil and deglaze the pan about 1 minute. Pour the cognac and the fond over the chicken; add the reserved marinade, 2nd bottle of wine, beef stock and bouquet garni. 12. Bring to a boil, reduce heat to medium and cook for 30 minutes adding the mushrooms, onions, bacon after 15 minutes. 13. Remove the chicken, bacon, onions and mushrooms, set aside and keep warm. Remove and discard the bouquet garni. 14. Strain the liquid through a fine sieve, and pour off the fat. Clean the casserole, return the sauce to it and bring to a boil, add the demi-glace to thicken the sauce and when it reaches the consistency thick enough to coat the back of a spoon, add back all of the set aside ingredients, stir well and heat covered for about 15 to 30 minutes on low, prior to serving. 2. Drain the artichokes, place them in a food processor, and pulse chop for about 10 or 12 pulses. It should produce about 3 cups. Set aside. 3. Melt the butter in a small sauté pan on medium-low heat. Raise heat to medium, add the leeks and sauté until translucent, do not brown; then add the artichokes, season with salt and pepper to taste, and cook, stirring frequently, for about 6 to 8 minutes. Remove from the pan and set aside. 4. Add the wine and bring to boil, reduce heat to medium-low and slowly add the cheese, stirring constantly until melted. Shut the heat and add back the artichoke – leek combination. 5. Turn heat to medium –low, add the cayenne pepper and stir and cook for several minutes until thickened to a consistency similar to that of oatmeal. 6. Transfer the mixture to a small ramekin or cocotte and bake uncovered in the oven for about 30 minutes until the top is a light golden brown. Remove any excess oil that rises to the top and place under broiler for 2 to 3 minutes to lightly brown. 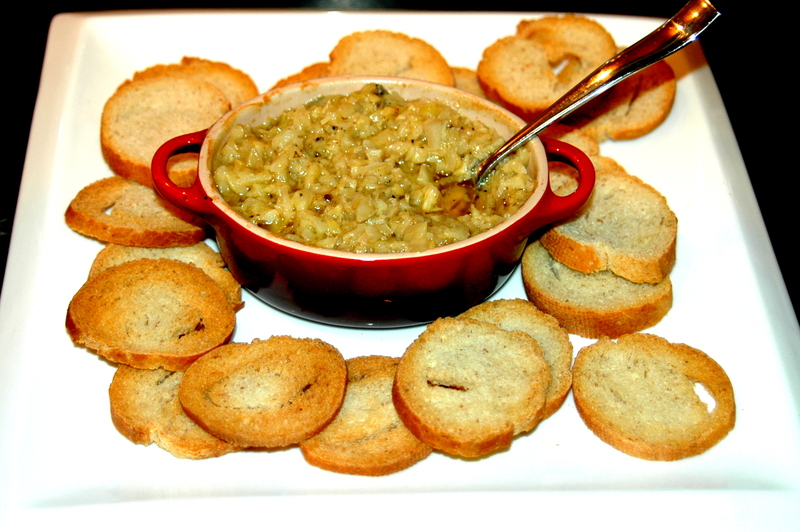 Serve with lightly toasted thinly sliced pieces of French baguette. 2. Using a small spoon, fill each pitted prune with Gorgonzola cheese, about ½ tsp. of cheese for each. 3. 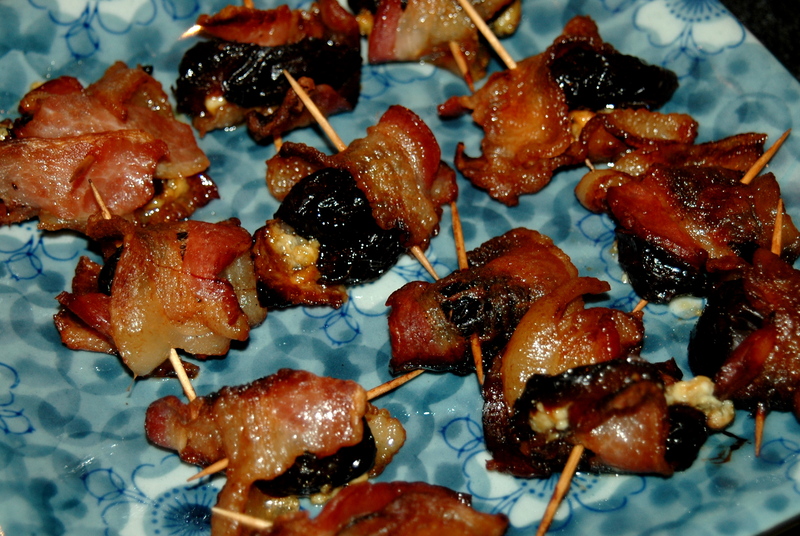 Wrap each filled prune with a piece of bacon and secure with a toothpick. 4. Place the wrapped prunes on a baking sheet and bake in the oven for 45 minutes until the bacon is crisped, but not burnt. 5. Let cool for 5 to 10 minutes and serve warm. It has been said that ‘imitation is the sincerest form of flattery.’ We recently had occasion to visit two vastly different restaurants on the eastside of New York. L’Absinthe, a beautifully decorated brasserie located on the Upper East Side that is evocative of Belle Epoque Paris, and Freemans, a funky and charming restaurant in the Bowery on the Lower East Side, that with its rough-hewn tables, wide floor boards and private rooms is suggestive of a Colonial American tavern. Betty and I enjoyed a wonderful dinner at the former, which presents a classic brasserie menu including Foie de Veau, sautéed calf’s liver and Coq au Vin, chicken braised in red wine. The following morning we met our friends Colin and Bernadette for brunch at Freemans, where we enjoyed two outstanding appetizers, Devils on Horseback and a hot artichoke dip served with crisp French bread, followed by traditional brunch dishes with innovative twists. We will be back to both restaurants in the near future, as each was memorable in its own right; food service and ambiance, all at a reasonable price. But in the meantime we decided to try to replicate the appetizers and the Coq au Vin and invited our friends Ed and Anne to be the guinea pigs. Being world travelers, fine cooks, and people who enjoy food and wine, they were the perfect dinner guests with whom to share these ventures. The Devils on Horseback were the easiest to replicate, as our waiter at Freemans was forthright in responding to the question ‘what are they?’ The hot artichoke dip was a little more complicated and required some thought and experimentation, as it was obvious that cheese was an essential ingredient along with non-marinated artichokes. But what cheese, which fat and how much savory? According to our guests, we got it right. 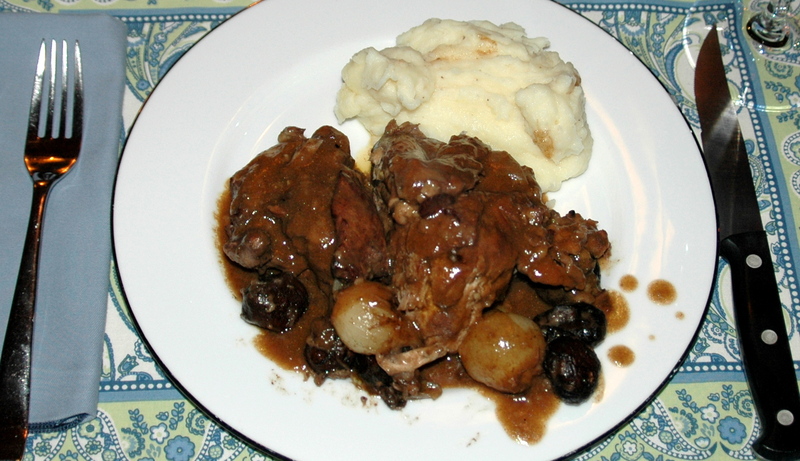 The Coq au Vin was the most complicated, and in order to limit the preparation to a manageable amount of time and effort, as well as utilize ingredients that are readily available, the consultation of three cookbooks was necessary: Mastering the Art of French Cooking, French Classics Made Easy and The Food of France. We think we got that right too, at least all of our plates were clean at the end of the meal. The Coq au Vin required two bottles of Côtes du Rhône and we and our guests required another two bottles. As a very wise man once told me, ‘you can’t go wrong with a good bottle of Côtes du Rhône.’ He was absolutely correct. Bon appétit!